Among some old photographs that belonged to my great great grandfather, Samuel Young, was this photograph of an old bridge. Unfortunately, there were no identifying markings on the photograph or the card it was pasted.The actual photograph is 6" x 8", and is pasted on a piece of decorated card stock, about 7" x 9". The bridge is a wooden truss bridge with masonry trestles. The overall span of the bridge is over 50ft (estimated from the men's height) and the height from the deck to the top is about 11 ft. I feel sure this is a wagon bridge, and not one build for train use. I would really like to date this photograph, and if possible, identify the location. I am hoping that by identifying the men, I might be able to achieve my goal. I think the photograph was taken in the 1870-1890's. Given that time frame, and where I know Sam Young was living, I think the bridge would be most likely in western Wise County, around the Bridgeport / Chico areas, or in eastern Jack County, around Cundiff or a bit south of there. 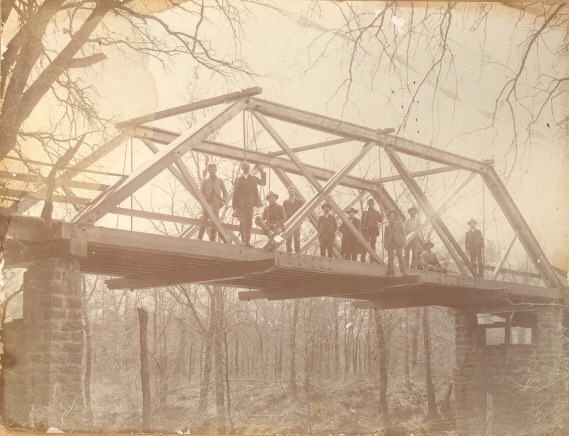 If the photo should date earlier than 1875, it may be in Denton County. The 6th man from the left seems to be a dignitary of sort. Possibly an engineer, contractor or county commissioner. He is the only man wearing a tie and appears to be dressed more "business like". If anyone can identify the bridge or even any of the men on the bridge, it would be helpful. © 2006 Norman M. Lewis, Jr.